My sister is amazing in the kitchen! She is always coming up with something new and that’s one of the many reasons as to why I admire her so much! Plus it’s a pretty fair system: she cooks and I can sample things:) The only thing is that I’m living in north jersey and she’s in south jersey at culinary school. I only get to taste her latest creations when we are both home or when we visit each other. Anyway! This is Breakfast Bruchetta. 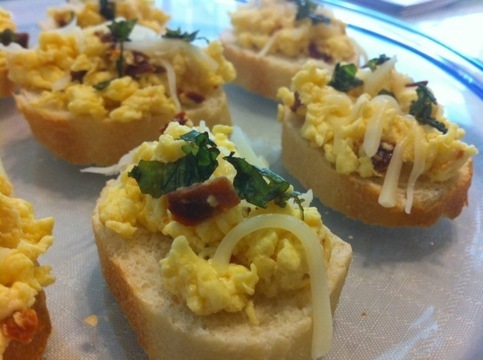 Eggs, mozzarella cheese, sun-dried tomatoes and fresh basil. It is light, yet so satisfying!